Enrico Battaglin (Bardiani Valvole-CSF Inox) darted ahead of the peloton on the stone slabs of Serra San Bruno to win Stage 4 of the Giro d’Italia today, ahead of Fabio Felline (Androni Giocattoli-Venezuela) and Giovanni Visconti (Movistar). Overnight race leader Luca Paolini (Katusha) retained the Maglia Rosa. "I was good yesterday and I hoped to win, but in the end it felt more like a Moto GP than a bike race and I was dropped," said Battaglin. "Today the climb suited me, the rain might have stopped some riders, and the gradient wasn’t too hard, and even though I attacked a bit early, it went well." Commenting further on his second pro win: "In 2011, after I had won everything as an amateur, I started my pro career winning at the end of 2011 (the Coppa Sabatini in October 2011). Perhaps I thought it was easier than it really is. I may have paid for that last year (no wins in 2012). This year, I was determined to show that I’m a good rider. I worked hard in the winter and I’m starting to reap the rewards." And regarding his rivalry with the ‘other’ young Italian, Moreno Moser: "So far in our professional careers, Moser has been stronger than me. He demonstrated last year that he fears no one. But we know and respect each other, and this year I want to make up for lost time, and I’m on the right road now." Luca Paolini continues in the Maglia Rosa: "I knew it was a hard finish for me, at the limit of my possibilities. The team rode around me from the morning, pulling until the breakaway was in reach. Then, on the two climbs, I tried to stay up front as much as possible. In the sprint finish I was just trying to finish the stage without letting a gap open that might put my Maglia Rosa in danger. Today it wasn’t about winning the stage, but keeping the Maglia Rosa. Either way, I didn’t have the legs to sprint." Bradley Wiggins was caught in a split in the bunch following a crash in front of him and crossed the line 17 seconds behind his rivals on the soaking wet finish in Serra San Bruno; the time lost dropped him from 2nd to 6th on GC. Although the crash occurred with 3 km the race jury determined that Wiggins had already been distanced when he was caught behind the crash of Cristiano Salerno (Cannondale). 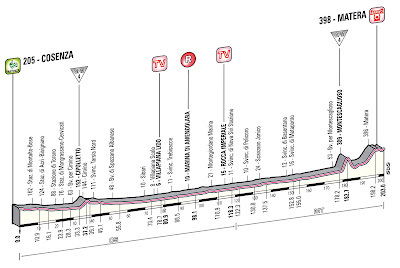 Tomorrow: 203 km Cosenza - Matera. A flat(ish) stage: the first climb of Cipolletto is 3.9 km at 3.3% ( 8% max). At 180 km the riders will arrive at Montescaglioso, 4.0 km atl 6.3% (10% max). 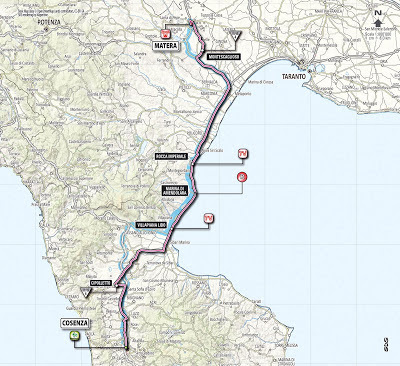 After this the riders arrive in the city of the Sassi for the finale. Great to see Uran up at the head of the field at the finish. Ironic that Wiggins was going to challenge Froome in France in July - it would be great to see Uran challenge Wiggins in Italy - See how he likes it! C'mon Roberto - do what Roche did to Visentini all those years ago and make it arabiata! 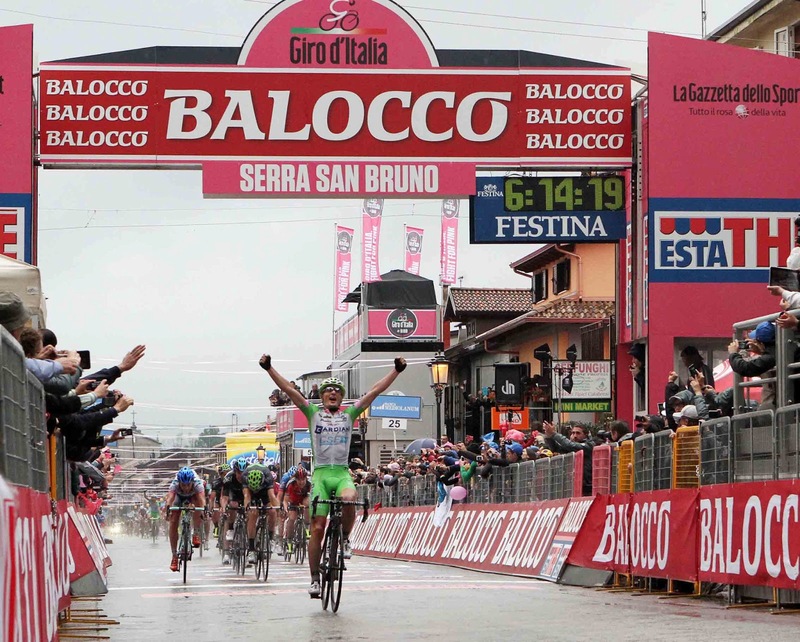 @ Giapanese: "Nibali moved ahead of Wiggins at Serra San Bruno on Tuesday, when the Sky captain yielded 17 seconds in a frenetic, rain-soaked finale that raised eyebrows at Gazzetta dello Sport. Noting that Wiggins's Colombian teammates Rigoberto Uran and Sergio Henao had contested the stage win rather than wait for their leader, the newspaper speculated on Wednesday morning that the pair had defied orders to chase their own objectives." That might be because they won't be on the team next year....?? ?